Every now and then I browse through our local equivalent of gumtree to look at the musical instruments up for sale. Yesterday I spotted this Ibanez GRX40, beginner's level HSS strat style guitar. Something about it appealed to me and I thought it would be a fun project to clean up, do a full setup and have some fun, especially as I am not a tremolo arm user and maybe having a cheap starter guitar I would not feel I was risking damaging a nice guitar by getting used to a tremolo arm. Anyway, it quite understandably turns out the seller wants to sell the guitar, amp and FX pedal as a job lot and has someone interested. So I spotted another cheap guitar for sale, a Jay Turser. I had not heard of this brand before and so, to see whether the price was at all realistic, I looked at what Jay Turser guitars are for sale on eBay. My goodness, the descriptions! One said the guitar for sale has a medium brown neck. Another said that it will need new strings as one has broken. There were other comments like these that show, sadly, that starter guitars too often go to those who never get past the entry gate. So, I have a growing desire not to be afraid of tremolo arms. Hmmm, lets see what happens - will it abate or grow further? Just to throw in my 2 pence worth, based I admit only on a little bit of experience, but I feel the doing up a cheap guitar route can only take you so far, and is generally not a sound idea financially. I guess what I'm saying is that they are not worth spending a lot of money on with upgraded parts, because a) there will still be some cheaper aspects you can't improve, and b) you would have been better off taking the whole sum invested, and spending that on a better guitar in the first place. But of course that is not to say you can't make good improvements to a starter guitar just by sorting out the setup, oiling the dry fretboard if needed, etc. But honestly, I would have thought a player of your experience and level should look a bit higher up on the guitar scale Lester. Like you, I've tended to steer away from tremolo use, but have thought of having one guitar set up with a floating tremolo. I really liked an Ibanez RG370AHMZ I tried the other day in G4M, which had a locking system - not something I would have thought I'd like, but it seemed to be high quality hardware, and worked very well. That guitar was around the £400 ish mark I think, but I suspect in terms of value and playability, a better bet than an upgraded starter guitar. I agree Megi, the cost invested in a starter guitar will never be realised in selling the upgraded guitar. Returning it to original spec and selling the upgrades separately can recover more money, but is a ball ache. The true advantage is in developing your skills in amature luthrie. You can cut not slots, level frets and dress the fret ends. Play with the truss rod, shim the neck. Experiment with the trem springs, adjust pickup heights and generally learn a lot while expanding your skills. No one else is likely to pay a premium for all your hard work, but next time you have a quality instrument to work on you are confident of your abilities. Starter guitars are great for learning the skills as you can buy a battered Squier for £30, take it entirely to pieces, rebuild it, set it up and if at the end of the day it is bu**ered, you are only £30 down. That is how I started. Later I bought one Squier Affinity (£50 including amp, cable, bag, strap, and CD - a beginner bought it and found guitar wasn't as easy as it looked), did a lot of work on it, and passed it on to my Grandson. He reckons it is the best playing and sounding guitar in his collection. It is not worth anything to sell, but he would have to spend at least ten times the original price to replace it. My Strat has an unusual tremolo and was the first guitar I got that had a tremolo on it. Chandlers in Kew, London, sadly no longer there, did some fret dressing and flattened the tremolo to the deck and I have been happy with that for the last 30 years - and will be for the next 30 because so many have commented that that particular tremolo in infamous for breaking strings, a problem I have not encountered. 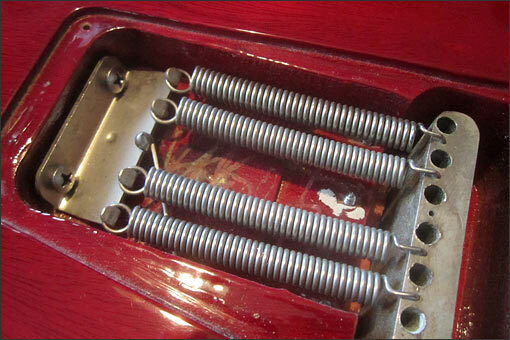 Looking for the tremolo springs - where are they? 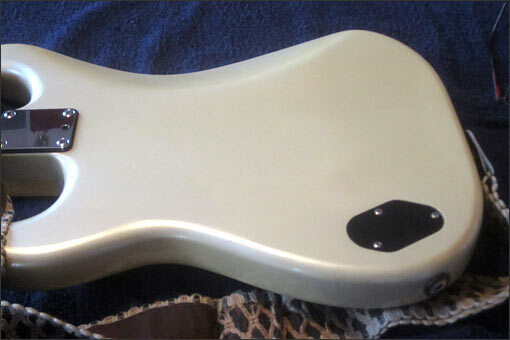 I unscrewed the pickguard but as the guitar is strung and the pickups and pots are mounted in the pickguard, I couldn't even see inside the guitar. Maybe when I next change strings I will. My only other guitar with a tremolo is my 1991 PRS Custom 24. I hesitate to dive in with such an expensive guitar. Once I know what I am doing this is the guitar I would like to have set up for me to enjoy using a tremolo. The tremolo allows me a half step up and who knows how far down; a minor third is not hard but after that I am unsure whether I am just fighting spring resistance or the mountings or what. I would like to be able to go up a minor third. I guess I could move one spring to the centre and remove one and see what that does. I have no clue, other than to do it with slackened strings, probably. Browsing the web, guess what I found? Guitars where the neck doesn't sit in the neck pocket, others where screws have rusty heads, any yet more with visual problems that are not mentioned in the advert. Boy have I become fussy! However, I also found one new guitar - here - that sells for under £100 new and has a Floyd Rose licensed tremolo. I think we know the brand, thanks to Megi. I am still musing over the possibilities. 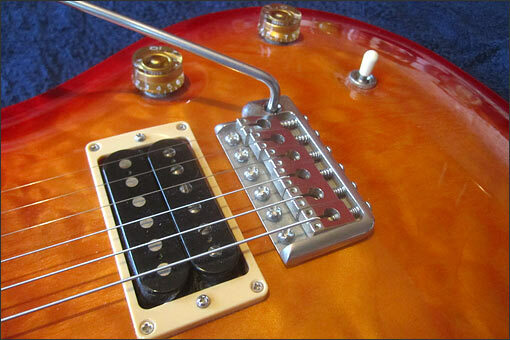 A Floyd Rose sounds like a great place to learn about using and adjusting tremoloes. Maybe I'll get over this desire before I buy something. I'll keep you posted. Just to say, despite my past endorsement of a certain brand, I'd be a bit cautious re the guitar you link to Lester - I just find the price a bit too good to be true, and wonder if there might be some kind of issue with the guitar that the seller hopes you will overlook given the low price. I have occasionally checked what the shop in question are up to, and it's been a fair while since they've put up such a "bargain" price, and perhaps they've got to the dodgy end of their stock of that model - just a thought though. Look at what Richard's Guitars has for sale: a secondhand Jackson JSX-94 for £199. But I don't particularly like black as a colour. Apart from the colour, everything else about the guitar appeals to me, especially a fast, slim neck. My wise wife asked whether this could be the guitar I learn about tremoloes on and then we could pass it on to our nephew who has a Strat copy yet he really wants a Jackson. What a brilliant idea ... so I bought it. There really isn’t anything you can mess up on a guitar so badly that you’ll be out of pocket as much as the cost of the guitar. Just about everything can be adjusted and readjusted back again, except for obviously the finish. But that’s just cosmetic anyhow. Go for it, have fun! I came across Jay Turner a few years ago while in Canada and they were regarded as a good option to Squier, if not better. I would have no qualms living with one, even stock. Great guitars, even. I’ve spent years adjusting trems and resigned myself to thinking I’d have to buy a boutique system to get it to feel right. I watched videos, bought books, nothing worked properly. But after watching this video, and spending about the same amount of time with my own trem, I’m happy for the first time! A friend of mine who has had more guitars than I’ve had hot dinners was amazed when he played it. He had no idea that you could actually tune a tremolo. Brilliant stuff. I do this to all my trems now and it’s so easy! Once I got to grip with the Floyd Rose I found it easy to work with. 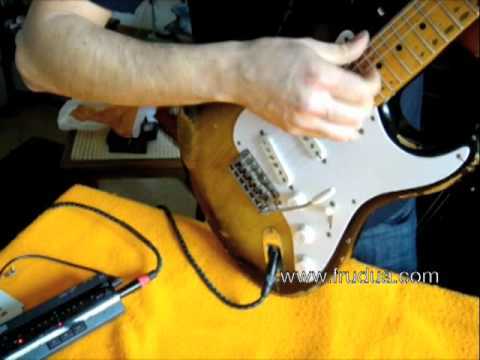 As a tremolo system it is better than those on the Strat and such. The fact you have to cut the ball end off the strings is a worry and getting the strings to grip was a bit hit or miss. 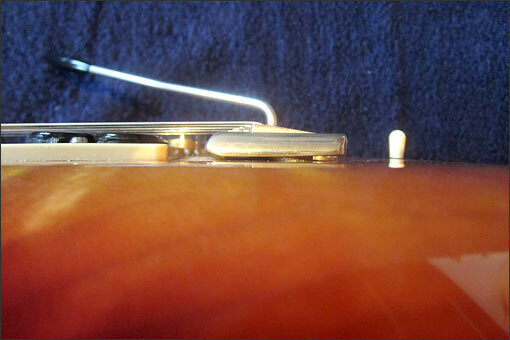 The locking nut and tuning at the bridge takes a bit of getting used to. The number of times I adjusted a tuner before remembering I should have gone to the other end of the string! There really isn’t anything you can mess up on a guitar so badly that you’ll be out of pocket as much as the cost of the guitar. That is pretty much my thinking. 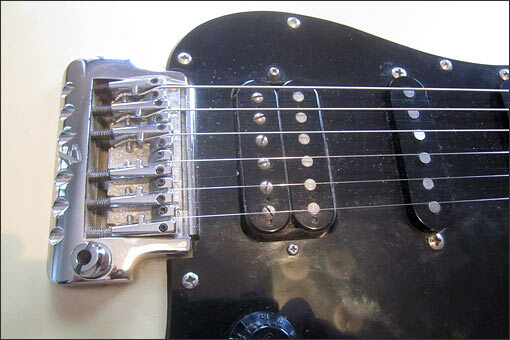 I was starting to look at more extreme applications of Floyd Rose tremoloes and Flying Vs caught my attention. I found a flourescent green one just 20 minutes down the road from me, which would have been great, except it is a hardtail. Pity. Nicholas, that video you linked to is great. Thanks for posting it. 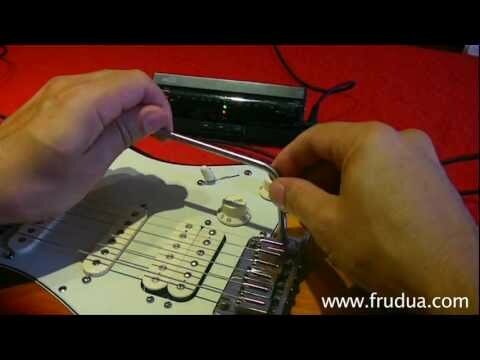 Another of his that is really quite an eye-opener for tremolo users is this one: How to keep your Strat tremolo in tune (below). It certainly showed me that being timid with the tremolo arm is purely down to a lack of confidence. Glad you liked it, Lester. 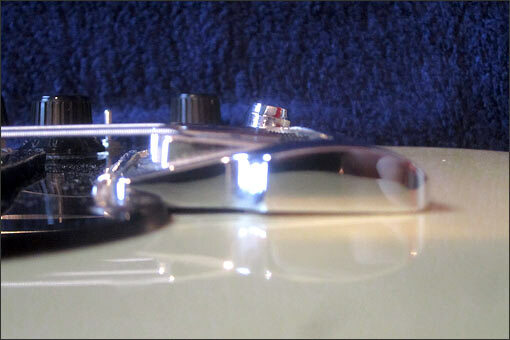 I agree, the fender style trem is meant to be abused! I use mine in anger regularly and never suffer from many tuning problems. Sadly I was put off buying one for years when someone in a shop told the impressionable 17 year old me that those trems can’t stay in tune and I should avoid them.